Sean Spicer misleading about online inaugural viewership. 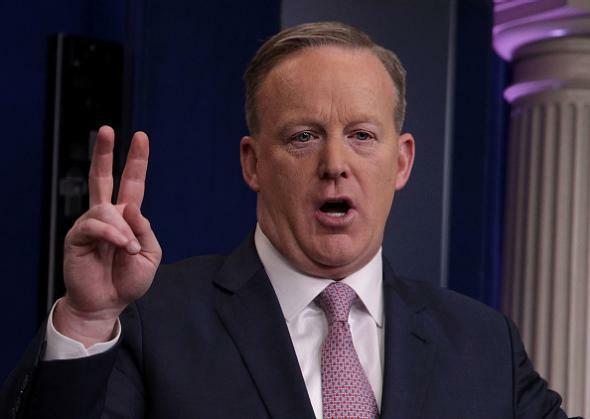 Press secretary Sean Spicer at the White House Jan. 23, 2017 in Washington, D.C.
We know that 420,000 people used the D.C. Metro public transit yesterday, which actually compares to 317,000 that used it for President Obama’s last inaugural. This was the largest audience to ever witness an inauguration—period—both in person and around the globe. With a number of Spicer’s Saturday claims about in-person attendance—including those about Metro ridership, tarps on the Mall, and “magnetometers”—having been contradicted by official sources, he turned instead today to the “and around the globe” part of his argument. Spicer now says he never meant to suggest that Trump’s in-person inaugural crowd was the largest ever—merely that the inaugural drew the largest total viewership ever when you count in-person, TV, and online audiences. You look at just one network alone got 16.9 million people online. Another couple of the networks, there were tens of millions of people that watched that online. Never mind the audience that was here, 31 million people watched it on television, combine that with the tens of millions of people that watched it online on a device. It may not surprise you to find out that there is more than one problem with Spicer’s argument. 3. Nielsen has not released an estimate of total online + TV viewership for the 2017 inaugural, nor has any other independent source. There’s just no entity that does that. Spicer is trying to come to his conclusion by eyeballing online numbers—but if he’s doing that, he has to account for what we know about Obama ‘09’s online viewership as well. And per the AP, CNN reported more “livestreams served” for Obama’s 2009 ceremony—21.3 million—than it did “livestream starts” for Trump’s this year. Moreover, as the Washington Post’s Philip Bump notes, Trump’s supporters are on average older than Obama’s were, and thus would seemingly less likely to watch an event online. Of course, if they did watch online, Trump’s supporters probably would have been more likely to use FoxNews.com. (Fox hasn’t released streaming info.) Trump also did have a higher peak CNN stream number—2.3 million—than Obama’s 1.3 million. And the video streaming company Akamai says it served a peak of 8.7 terabits of data per second during Trump’s inaugural as opposed to 1.1 tbps during Obama ‘09. But as this TechCrunch piece notes, contemporary HD video streaming involves a higher amount of data per stream than 2009 streams would have involved. CNN also might have hosted more concurrent streams this year because of better technology, not because there were more total viewers trying to watch. So those aren’t apples-to-apples numbers either. The evidence that Trump might have had more online viewers than Obama, in other words, is extremely mixed. And the evidence that he had 8 million more online viewers than Obama—enough to make up for Obama’s larger TV and in-person audiences—is nonexistent. There is simply no way to definitively assert, “period,” that total viewership was higher for Trump’s inauguration than for Obama’s or Reagan’s.